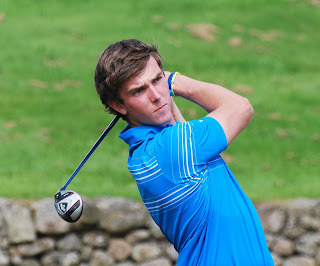 The North of Scotland 72-hole men's amateur championship, a Scottish Golf Merit Tour event will tee off over the Royal Dornoch course this weekend with an entry of 75 that includes the defending champion, Jeff Wright (Forres), pictured. The attraction of the world famous venue and the prestige of having your name inscribed on the Major David Blair Trophy attracted an original entry of 95 but on handicap elimination that was reduced to 75. Sunday's field for the final 36 holes will be reduced to the leading 40. David Blair, pictured below, was born in Nairn in 1917 and was the son of an Army general. Throughout his life, which came to a close in 1985 at the age of 67, he always regarded The Nairn as his home golf club, even when in 1978 he served a year as Captain of the Royal and Ancient Golf Club, St Andrews. Following the same military career as his father after education at Harrow and Sandhurst, he joined the Seaforth Highlanders and he rose to the rank of Major with battle honours and an MC award. He was essentially a spare time golfer. His swing evolved in Nairn to become one of the last breed of true successful amateurs. His only lessons, given by the Nairn professional of his day, Peter McEwan, who groomed him to become the first winner of the Scottish boys championship in 1935. 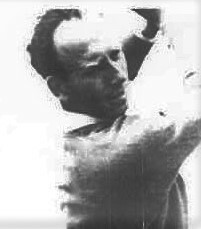 Further success followed, representing Scotland in Home International matches and winning the Scottish Amateur championship in 1953, then Walker Cup selection in 1955 and again in 1961. But The Nairn Golf Club was always dear to his heart and on a holiday to Nairn in 1970 he played in the inaugural North of Scotland 72 hole championship and finished second to its first winner, Willie Milne of Crieff. The following year he donated a trophy for the competition which now bears his name and when the first ball is struck at Royal Dornoch on Saturday it will be for the 48th time. In the early years of the competition the venue rotated between Nairn, Moray and Elgin and only after the Kessock Bridge was opened did Royal Dornoch come onto the rota in in 1978 to provide Strathpeffer Golf Club with its only winner, Dods Kryzanowski. But another Ross-shire golfer became a prominent winner through the next seven years, Steve McIntosh of Muir of Ord winning twice, 1987 at Dornoch and 1990 at Elgin. Since first played at Dornoch this will be the will be the eighth time the event has come to Sutherland and the six other winners on this course were Scott Henderson (Murcar) 1991, Roger Beames (Wick), 1995, Neil Steven (St. Andrews), 1999, George Murray (Earlsferry Thistle) 2003 and Michael Buchan (Cruden Bay) 2007. No member from the host club has won this competition and the Dornoch hopes this weekend are pinned on three members, Bryan Urquhart, Chris Mailley and Cameron Nelson. But the North has a good representation this weekend and after surrendering the equivalent North-east 72 holer last weekend at Newmachar, Moray's Kyle Godsman will be hoping to bounce back at Dornoch. Godsman finished in a tie for fourth place at Newmachar with cards of 73, 74, 75 and 70 for four-over 292. Also from the North were Inverness pair Keiran MacKay (300) and Cameron Franssen (320) and Jordan Shaw (Boat of Garten) 303. All three are in the Dornoch field and are likely contenders along with former Blair winners, Euan Forbes (Inverness) 1994, and Stuart Tatters (Moray) 2014.